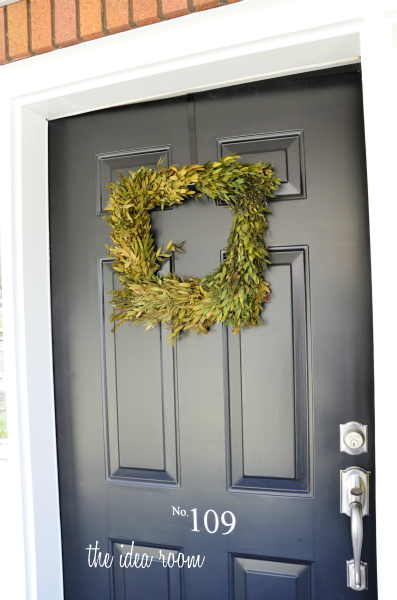 Some of you were curious about how I made this initial DIY wreath that is hanging on my new front door. 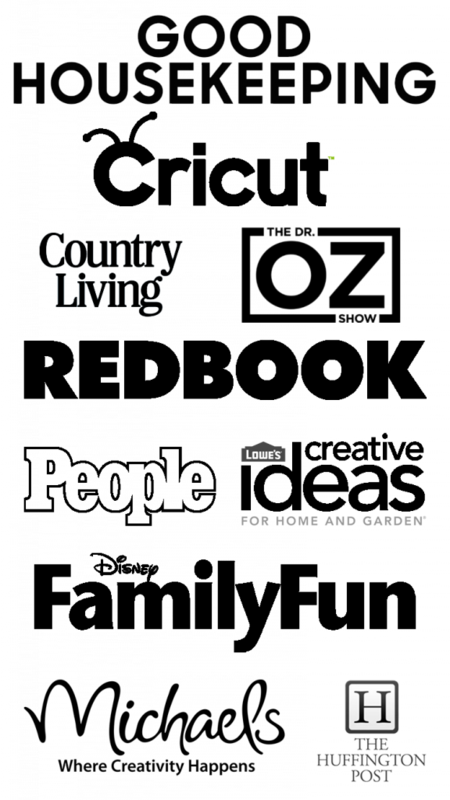 So today I am going to share with you how simple and easy it is to make, so you can make one for your house. 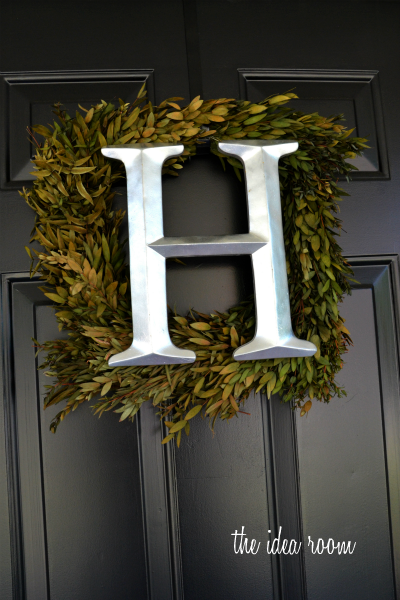 I had this square boxwood wreath that sort of bugged me because it was shaped funny. One side was fuller than the other and so I didn’t like the wreath just by itself…OCD much?! 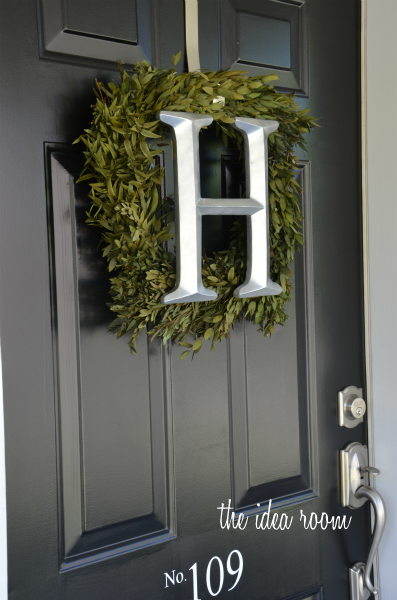 I hung the wreath on a door hanger that I spray painted black. 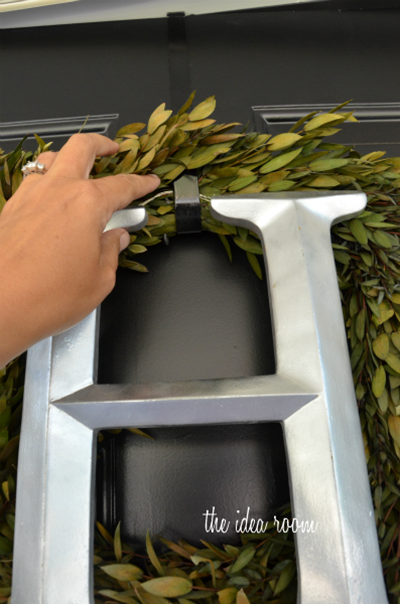 I took my initial “H” which I found at Hobby Lobby and spray painted it silver with Krylon Metallic Silver Spray Paint. I LOVED this spray paint. 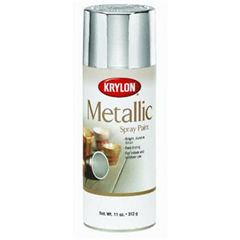 It had great coverage and the finish is so smooth and silvery! 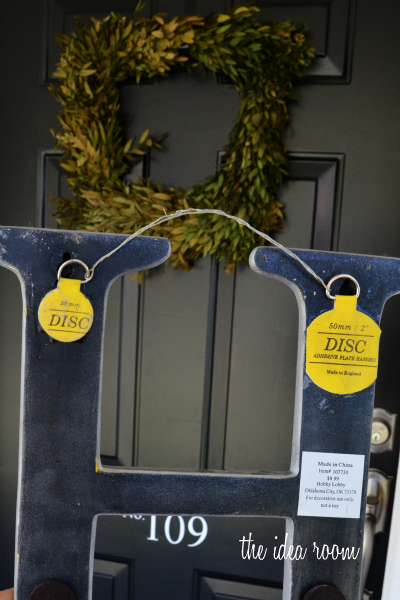 To hang the letter, I used two disc hangers that I had leftover from another project. These are really easy to use. They are made to hang dishes and platters on the wall. As you can see I had two different sizes and had to cut one down…but it worked great. Then I ran some triple thick wire between the them so I could hang it on the door. I also added a couple of foam pads to the back of the letter so it didn’t bang against my freshly painted door. You can see them just at the bottom of the above photo. Then I just slipped the wire on the letter H over the hook of the door hanger so that it sat in the middle of the wreath. The letter hides the un-evenness of the wreath but provides a nice backdrop for it. Pretty simple right? The H worked nicely to hang since there are two top pieces on the letter to hang the wire. 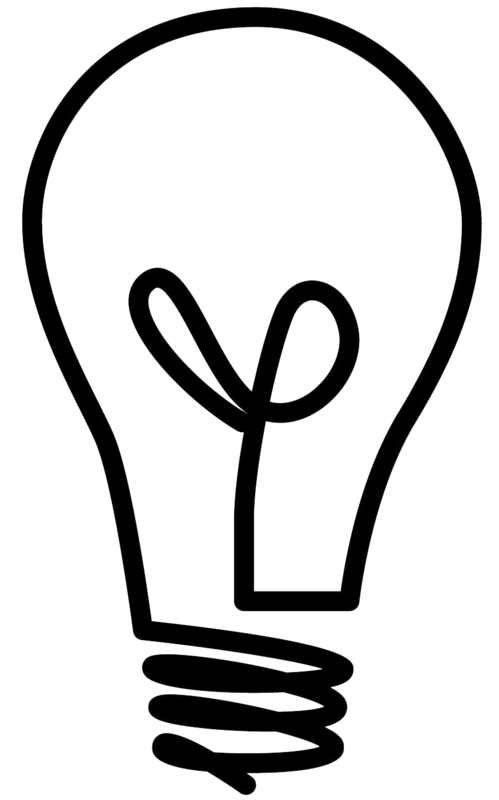 You could make a slip or a lasso type of top to some wire and hang from a letter with only one stem if needed. What a lovely idea. Making front doors inviting. Thank you. 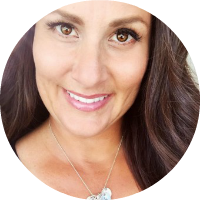 Amy, I love this idea! It’s perfect for when you’re renting a home and cannot make a lot of holes in doors or major changes. I do have a question though–our rental home has a dark red door–any color suggestions for the letter? I wasn’t sure if silver would look right. Plus, the square wreath I have is made of straw, not green leaves. Love the wreath. What color is your door painted? This is a lovely and intriguing wreath. Your instructions were excellent. Thanks for sharing this creative project.